The R-PLEX Human Ghrelin (total) Antibody Set includes a matched capture and detection antibody pair and calibrator for the quick and easy measurement of Ghrelin (total) in biological samples. R-PLEX products leverage MSD’s electrochemiluminescence technology for better sensitivity and a larger dynamic range than traditional ELISAs. R-PLEX matched antibody sets enable the development of singleplex and multiplex immunoassays. Individual assays may be developed using MSD avidin- or streptavidin-coated plates. Custom multiplex assays with any combination of R-PLEX analytes, as well as R-PLEX plus U-PLEX analytes, can be developed on U-PLEX MULTI-SPOT plates. To learn more about the advantages of R-PLEX products click here. Calibration curve for the R-PLEX Human Ghrelin (total) Antibody Set was assessed and representative data are presented below. Description - Ghrelin (lenomorelin, GHRL, MTLRP) is a peptide hormone that causes the release of growth hormone. Ghrelin-secreting cells are found in many tissues of the digestive system, but are also present in lung and brain. Ghrelin is a key regulator of energy maintenance, affecting both storage and use of energy supplies, and thus is important in obesity and diabetes research. Ghrelin is also involved in cancer and bone metabolism. Active ghrelin (acylated at the serine 3 position) binds to the growth hormone secretagogue receptor type 1 (GHSR). 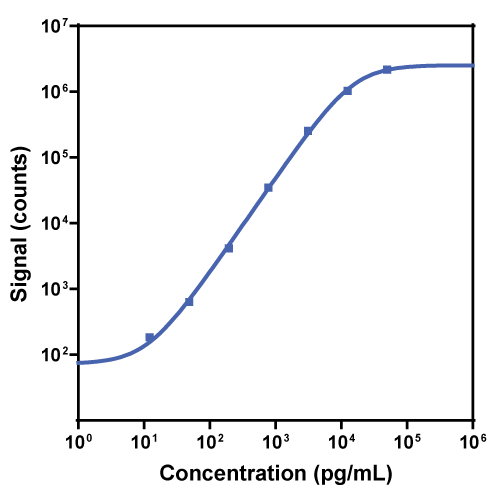 Note: This antibody set also detects rat ghrelin (total).